Cozumel has many different options as to where to stay. There are houses, apartments, or hotels, and accomodations can be found in downtown San Miguel, or in areas to the north or south of the Island. We recommend places where you have an ocean view with a nice shallow reef, like Mayaluum – these are new apartments with two to three bedrooms, ocean views, a location close to town, and a pier on side of the hotel (they currently charge $2 USD) to use it. 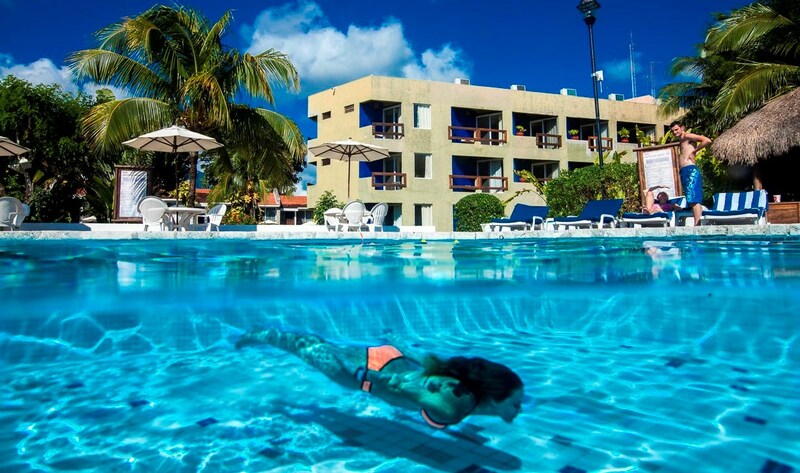 Hotel Casa del Mar, located south of downtown, is a hotel designed for divers, with a nice atmosphere, a pool, a pier, fresh water rinse-tanks, and is a great places for beach diving. There are also all-inclusive hotels like the Occidental, Park Royal, Iberostar*, and Wyndham. These are all located in the south part of the Island, near the diving area. We can pick you up from any pier between the Hotel Cozumel Resort and the hotels to the south, however, some hotels charge $3 USD for using their pier.